Pressure Vessel Code Compliance for Radio Frequency Cryomodules - Meyer Tool & Mfg. Tom Peterson of Fermilab graciously consented to allow us the use of his PowerPoint detailing his Oral Presentation at the CEC-IMCM 2011 conference. His presentation was held on Thursday June 16th in the C3OrF-Large Scale Systems—Risks and Failure Analysis session. In previous newsletters we discussed related topics (July 2009 “DOE Pressure Safety Rules”, October 2009 “Manufacture of a Helium/Hydrogen Heat Exchanger”) and are excited to see our discussions expanded upon by Tom’s presentation. We found Tom’s presentation to be of particular interest because it re-enforced the design approach Meyer Tool chose for the eight ASME Code stamped Liquid Helium Vessels we are presently building for Peter Ostroumov’s Superconducting Radio Frequency (SRF) group at Argonne National Laboratory (ANL). These quarter-wave resonator (QWR) niobium cavities are part of the upgrade to the Argonne Tandem Linac Accelerator System (ATLAS). The cavities are surrounded by a liquid helium bath at 4K. At this temperature the niobium becomes superconducting, resulting in a highly efficient translation of the radio frequency energy to accelerate particles (heavy ions in the case of ATLAS) within the accelerator. As part of ANL’s safety review and as one method to satisfy DOE requirements regarding pressure vessels, the team at ANL decided to ASME Code U stamp the Liquid Helium Vessels surrounding the cavities. As an expert in ASME Code fabrication and having over a decade of experience in working with niobium cavities and related components, Meyer Tool developed the detailed ASME Code calculations and fabrication drawings for the Liquid Helium Vessels. 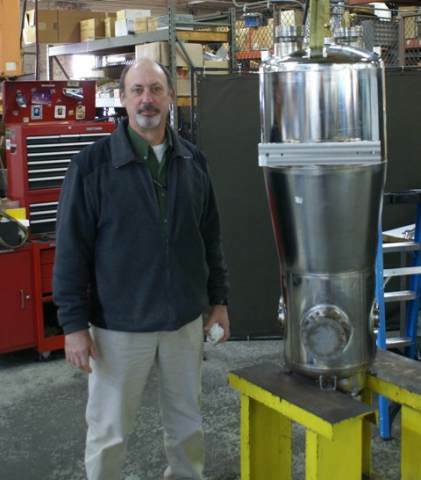 Jim Morgan of ANL stands next to the first completed ASME Code U Stamped Liquid Helium Vessel surrounding a superconducting niobium QWR RF Cavity. The Liquid Helium Vessel was designed for ASME Code and fabricated by Meyer Tool. 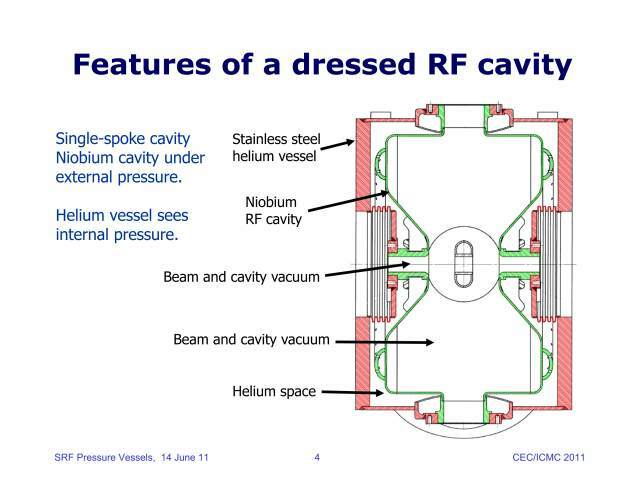 Features of a dressed RF cavity from Tom Peterson's CEC talk. For the ASME Code design of the Liquid Helium Vessels for the ANL QWR cavities, we choose to define the pressure vessel boundary in such a way that we excluded the niobium cavity. This approach is identical to the approach taken when designing a cryogenic heat exchanger containing an inner coil surrounded by a cryogen bath pressure vessel. The inner coil is not considered part of the pressure vessel while the interface nozzles where the coil exits the vessel are. In the case of the QWR cavities, the 6 inlet/outlet and beam line interfaces between the inner niobium cavity and the outer stainless steel helium vessel were treated in the same fashion as the inlets and outlets of a heat exchanger coil. The nozzles were considered part of the ASME Code vessel, with the last Code weld being between a stainless transition on the niobium cavity and the nozzles. This approach is discussed in Tom’s presentation with Meyer Tool’s work being cited as an example. Read Tom’s presentation at “A Survey of Pressure Vessel Code Compliance Methods for Superconducting Radio Frequency Cryomodules”. If you’d like to discuss this topic further or want more information, please contact us.